Going on a recent tour to see fiber artist Betsy Meyer was a wonderful chance to be in her lovely home and enjoy art. We were invited in to see her studio, located in an efficient small room just off the dining area. Betsy showed us some recently completed pieces, and we loved the chance to see what she presently had on the loom. She shared some of the journey that brought her to making the SAORI style weaving that she so enjoys. We were invited to explore her home to see all the artwork on the walls. It was obvious that Betsy loves the freedom that SAORI weaving embodies. This freedom from constraint is what captured our imagination when we looked closely at Betsy’s work. 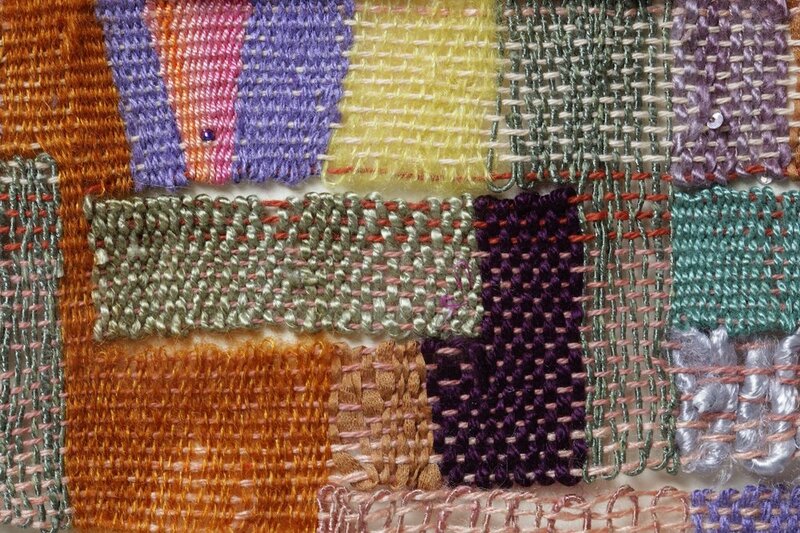 She introduces texture, color, pattern breaks and all types of assorted fiber materials, together working harmoniously as if they were a narrative told by Betsy. Thinking back on the visit – the aspect of being in someone’s home seeing art reminded me of growing up and staying with my Grandmother while Mom & Dad worked. My Grandmother loved to visit people, and she didn’t drive, so one of my uncles would be our chauffer and off we’d go. It was nice to spend a little time with family and friends – you’d catch up on their lives and see what ‘work’ they were doing around the house. Most often it meant seeing the garden or the flowers and potted plants around the porch. It was just a pleasant thing to do. Nowadays we feel we have to be invited because we don’t usually feel comfortable dropping in on people. Please consider this your invitation. On our tours we’ll spend time with artists, sometimes in their homes, or sometimes in their separate studio spaces. It’s a chance to visit and see new works of art just completed – and others in the process. Maybe you’ll discover the perfect piece for a spot in your home – or for a gift you wanted to find. Or, you might just hear a tidbit of information that brightens your day, or see a lovely handcrafted item that brings you joy. Visiting Betsy brought back that feeling of seeing family and sharing laughter. We were inspired by her journey and the passion she has for her art. So, come on - let’s take an art tour!